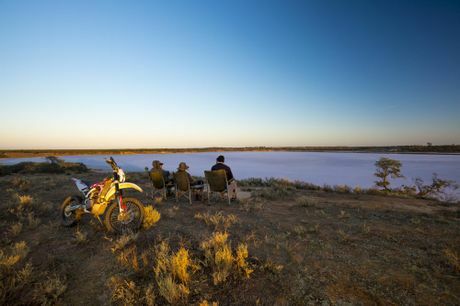 There's something about waking up perched on top of a sandhill looking over a salt lake as the sun pops over the horizon. The lake went from a dull sheen to a low pink as Milo turned shadow to green. Wow, I remember rolling over and thinking more sleep would be good but this sunrise would be better. And it was. Boy was I comfortable though. I reckon I've got this camping thing nailed now, at least from a purely selfish point of view. It's all Darche basically, proven stuff and super comfortable for the err, bigger fella. Big swag in a big stretcher, no need for the awning down here in the dry old Mallee country in Victoria's western deserts. Inside I've got my sheepskin rolled up for a pillow and the sleeping bag that started out underneath and wound up on top as the night chilled down. But I don't remember any of that, must have been on autopilot. The night before we'd camped up late after a big day's drive. The lads were further down the hill, Kenno with the MDC set up for a cooking scene but the bloke himself swagging it on a stretcher like me and Gleno doing much the same next to his Disco. It's not that I'm anti-social but I'd done my usual trick and parked Milo up on the ridge for the morning view. It's always been my favourite time in the bush. Not so much Melanie and Gav's though, although they know how to rock and roll before sunset when there's filming to be done. We'd filmed late the night before so I figured they'd be going the sleep in, comfortable as a couple of dingo cubs tucked up in their lair on top of the mighty 80 Series. Trust me, after some of the most comfortable nights of my life and then waking up in glorious places like these Pink Salt Lakes I'm happy to let the world know what works for us! It wasn't working for Anthony Warry though. Correction, it was, but he'd been so impressed with the wonders of the night sky he'd spent all night in and out of his swag doing time exposures over the salt lakes before setting up to capture the entire sun rise in glorious digital colour. You've probably noticed how good the photography is here at LowRange? That's our Anton, one of Australia's best outdoor photographers because he not only loves our country, he works harder at it than anyone else. 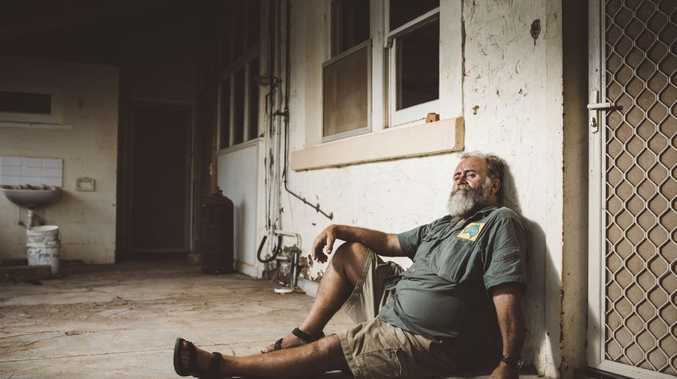 Anthony got his start with a pair of flippers photographing surfing competitions all around coastal Australia for 'Surfing Life' magazine before finally getting the chance to break free into the bush. A tough guy with a wonderful smile who's the total health freak of our group, Anton's photos deliver. Always. All we have to do is get him there! I was pretty happy to get on the road and kick off our third LowRange show, because this time we were heading to the place I've always called home. Yep, up South Australia's spine to the Flinders Ranges. Once again, LowRange is all about doing things the way we want this time around and taking the team 'home' was going to be a big personal adventure for me as much as them. I had no idea what to expect, last time I dropped over that last hill the place had been deserted. No signs of the road, not much of a track, I'd only managed to find it because of some inbuilt beacon picking a post between the hills in the distance. It'd been decades since the land was handed back to the original owners and not much had happened since. Well, not that I could see anyway. Maybe that's OK, there's been tens of thousands of years where not a lot happened before Cpt. Cook showed up. The land might have gone back to sleep quite happily. But we didn't. Not that morning anyhow. 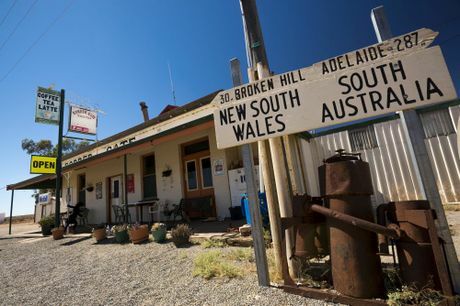 Camp was packed up pretty quick and we hit the road for the long haul to South Australia, spending a night off in a Broken Hill pub that gave us a chance to wash a few clothes in the hand basins before the punt straight west. Now when I was a kid the Flinders Ranges area was accessed by dirt track. Mostly graded depending on the time of year and pretty good travelling by the outback standards of the day but it wasn't anything like it is now. 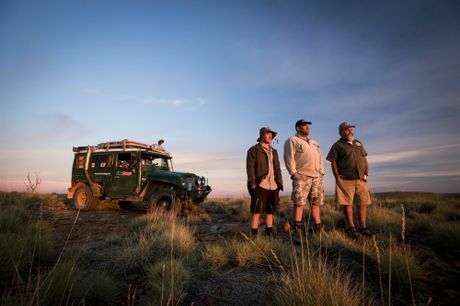 Travellers back then, usually in the high ground clearance two wheel drives of the 1960s, would wave when they saw anyone coming because it was just so rare and camp wherever they wanted to just off the track. These days the main route up from Adelaide is all sealed and tourist friendly and about as adventurous as a trip through the aisles of a supermarket. That's not the way I wanted the lads - and lasses, sorry Mel! - to remember the Flinders so when we got to Yunta the convoy swung right up the dirt track north to Baretta and beyond. This is lonely country, pockmarked with old sandstone relics left by pioneers beaten by country they thought they could tame. But coming home through the backdoor meant other things too, including a camp site just off the track the way I remember all those decades ago. We pulled up early evening and didn't see another vehicle that night, or most the day that followed. I cooked up the roast lamb you'll see on the DVD and yes, I burnt it something silly too. Not that it stopped it tasting brilliant, but I guess I had my mind someone else that night. The lads did their best to keep me on the ground though, mostly by keeping the beers flowing as we relaxed and sucked in air that nobody else had breathed. Big country this, bloody lucky we are! However, as much as I wanted this to be a raw experience, I knew the lads wanted to do a bit of off-road driving too. 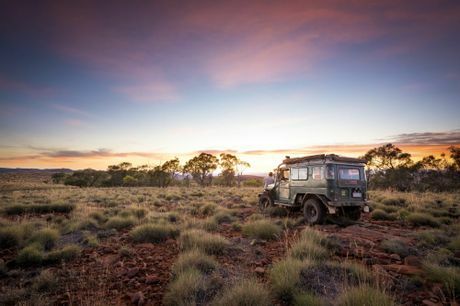 The best place in the Flinders for the whole 4WD adventure thing has got to be Willow Springs and the Skytrek drive with its incredible views over Wilpena Pound, rocky gorges and scrabbling hills. 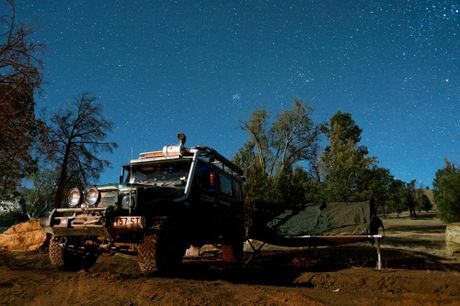 It's not comp truck hard, but it's not for the faint hearted and really, with the incredible hospitality of the Reynolds family - three generations on the same land with roots as deep as those huge ghost gums in the valleys - Skytrek is the must go place on anybody's Flinders trip. With Brendan and Carmel's youngest daughter Michelle stepping more into the Skytrek roll and son Chris taking over the farming I reckon Willow Springs is one slice of Australia you can always trust to stay as nicely grounded in common sense as it is in sheer beautiful terrain. I know our team loved it, because we sure had trouble rolling up the Darches next morning! Then everybody wanted showers - hey, it'd been a dusty few days! - before finally we got back on the road. Wow, when I think back I don't even know how I'll fit everything from that trip on these pages without leaving room for Anton's photography. And truth be known his photos are probably going to tell the story better because for me a lot of this time was spent just thinking back to my childhood and remembering that feeling of being such a little piece of such a huge place. So let's skip a whole lot of banter and let Mel and Gav's excellent footage tell the story the way nobody else can. 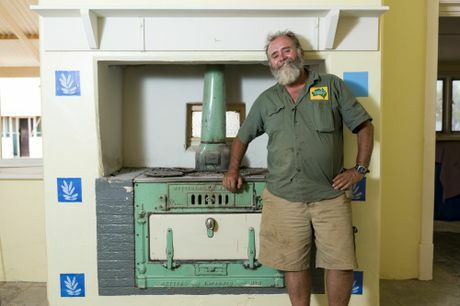 The homestead was there, they'd cleared up the tip paddock at some stage where a lot of my memories were quietly rusting away and there was a new air conditioned house tucked roughly where I'd learnt to shoot a twenty two pinging beer bottles off an old stump. Man things change in this country but not much shifts the country itself. Looming over the horizon was Mount Serle, the great saddleback hill that dominates this part of the land. I wanted to go see it up close, maybe even find the track I remembered as a kid. There wasn't a lot going on out here in the 1960s. There'd be social occasions for the adults, maybe a barbecue - always lamb chops - with the neighbours from time to time. School was over the radio, old Pricey used to buzz the station in his Cessna with the door pulled off so he could get his shotgun out on the eagles pinching his lambs and my biggest memory was the hoo-haa surrounding a bloke called Donald Campbell who was heading back to Lake Eyre for another crack at the land speed record. Like most of the people north of Adelaide it seemed, we loaded up the LandRover and went north to have a look. I was eight and that magnificent car the Bluebird and Campbell's 400mph plus runs tattooed itself on my brain. It's seems weird to say it now but this and Lawrence of Arabia on his Brough Superior motorcycle was for me all about being part of the biggest empire on earth, the British Empire. And Australia, with our endless supply of wool for the motherland's mills, was the frontier of that empire. Twenty years later, watching Charlie marry Diana, I was ready to rip down the flag and hoist the Southern Cross in protest. Hmm, funny how life swings you around isn't it? Right, but another memory from those good old days was that of the mad Canadian scientists - another frontier country - who spent half the year camped up on top of Mount Serle. They had this incredible little platform truck called a Haflinger, a crazy little two stroke thing that'd climb brick walls in a puff of smoke. I knew roughly where the track had been almost forty years ago and with not much more than a sense of familiar, I found enough of it to give the lads our own adventure up this mystical mountain. When we found what was left of their camp I felt like my whole life had done a circle and come back to where it began. Perched like an eagle over the backbone of the northern Flinders. Powerful stuff but it's a powerful mountain, something the original inhabitants knew too well. This was where there was always water, this is where teenagers became men, this was the place that anchored their lives. Back to Flinders 2: Roothy and the boys go for a camel ride. We don't know who to feel more sorry for, them or the camels. OK, I'm going to go watch the LowRange Episode 3 DVD again, this time in all its Blu-ray glory if I can work out the Xbox anyway. Yes, it's personal, but LowRange is about sharing personal as much as it is about working with the best people and companies around. We hope that LowRange inspires you to get out and experience our great country for yourself. See you on the tracks!